Last year, we wrote of "A summer for action!" As the following shows a lot has happened on some fronts and little on others. there is excessive impact on the local landscape. 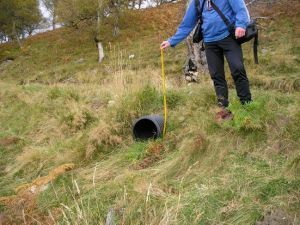 Aberdeenshire Council, SNH and the Cairngorms National Park Authority also submitted similar reports. We are pleased with the report submitted and the way our representatives were able to present their evidence at the hearing. They did a very good job for us. The hearing was reported in next day's Press and Journal, echoing these points and the united opposition from hillwalkers, the Council and the Cairngorms National Park Authority and SNH. We are still waiting for the Reporter to present his determination. We expect that he will be looking for some form of compromise. This must not be so soft as to let estates think that working on tracks without planning permission is an acceptable risk. We are also concerned that as and when planning permission is granted that it should be conditional on a higher standard of workmanship that will be monitored - hence the estates will have to budget accordingly. As we go to press in comes the Reporter's Decision letter on the re-determination of this track. This was caused by the CNPA deciding to challenge the Reporter’s original decision to over throw the Aberdeenshire Council's decision to require the estate to re-instate the work carried out to upgrade this track (ie the Reporter's rejection of local democracy). As expected, the new Reporter's decision is a bit of a compromise between upholding Aberdeenshire Council's original enforcement notice of 26th May, 2005 and allowing some of the terms of the sporting tenant's appeal to overthrow this notice. In the last Newsletter, we stated that we would be monitoring the estate's compliance with the conditions attached to the planning permission. Simple enough you might think! Well, Aberdeenshire County Council has been reluctant to tell us what they think is going on and how the conditions are being met. We need to explore ways of putting pressure on them to uphold these conditions. Since the last copy of Mountain Views, we have had volunteers out in the hills surveying. Response has been less than we were hoping for but we have still managed to cover a good range of tracks. We have decided to continue the project for another year to improve our coverage of the tracks in the Park. We now plan to finish the pilot project at the end of this year. The following was circulated to our Hilltracks Survey participants and it will bring our readers up to date with what has been happening. Firstly a "thank you" to all those who attended the Workshop / Training Day in January. It ran on well into the afternoon refreshed by tea and sandwiches and was generally considered a success with all participants learning from others' experience. A second workshop will be organised if there is sufficient demand and there's talk of a Barbeque in June. Now Spring is with us there's no excuse for not getting out into your favourite bit of the hills, armed with GPS and camera of course, and sending in your photos. All returns gratefully received but please use the spreadsheet templates provided. A plot of returns is published on the Hilltracks webpage and in our web journal to assist in route selection. The Hilltracks Group reported to our partners (CNPA and SNH) in February. Whilst we were concerned at the relatively low uptake last year, CNPA/SNH were pleased with start we had made and praised the amount of effort that had been put in by the volunteers. It was agreed that a good start had been to giving greater clarity to the overall state of hill tracks in the National Park and providing baseline information for monitoring their condition. The Group will shortly meet to examine the photographs submitted to see what additional information relating to the tracks can be extracted and to make a start on classifying them. Please note the points below and keep an eye on the 'Tech Tips' page on the website which is updated in response to contributors’ problems. Photographs should be taken 'in the direction of travel'. If you include photographs that deviate from this general rule please include an approximate 'look direction' (e.g. NNE) in the Comments field. If you want to submit more than one photograph from a particular location; record duplicate points on your GPS with unique photo IDs so we end up with separate records/entries for each photo on the returns spreadsheet. As well as recording intersections and changes in path width or surface make sure you record where you join or leave a track or where a track ends e.g. a turning point. Track evolution is of interest especially in areas previously access only on foot. Some footpaths and old stalkers paths are now being used by 4x4s. Repeated driving of quad bikes / trikes over the heather can evolve a track which may be discontinuous but should be recorded where in it impacts significantly on the landscape. Finally please check the Data Form you submit is formatted so as any 'leading zeros' in the coordinate fields appear correctly - see 'Tech Tips'.